I think I might have time to try this in a couple of weeks, so I'll give it a shot and let you know how it went! I am curious if they'd suit my figure. Awesome tutorial! Thanks for your comment. There must be something in the air :-) I love your finished product btw. I think I've got to ditch the pleats though. Too much fabric all over the place. I had one great pair that went missing - now I can make a few more pairs myself! Oooh these will be awesome in silk as skirt underthings so I can ride my scooter in a skirt without causing accidents! Thank you! I haven't ever been completely happy with any coulottes or coulotte patterns I've found because the front never seemed to hang correctly. I suspected that the inseam needed adjustment. I found your site and tried your pattern. I didn't quite understand the directions for the pleat, so we bought another pattern and adjusted the inseam according to your directions. The coulottes turned out great and hang correctly. Ooh I am curious, how did the pleats work out again? wow I just love the way you explained it. Thanks a lot.Going to try it right away.Do you think it will work if I make a 3 piece paneled pieceand cut the skirt pattern out of it? wow thanks for this! those are awesome skirt pants!! :D totally making me some now! thanks again!! This is a great tutorial, very easy to follow and it has resulted in some pretty great culottes for me :) http://ingemaakt.com/2013/07/20/culottes/ thank you very much! die 10 cm voor de plooien, is die 5cm links van de middenlijn en 5 cm rechts? Hoe bepaal je de sitting height? Ik geef je graag antwoord, maar je profiel bevat geen email-adres dus doe ik het maar zo. Middenvoor blijft middenvoor (en middenachter middenachter) dus de ruimte voor de plooien wordt, in zijn geheel, toegevoegd ernaast, in de tekeningen in de tutorial rechts van middenvoor/achter. Sitting height is zithoogte. Een veel gebruikte maat voor broeken en dergelijke (Knip en Burda leggen dit uit bij hun maattabellen) die ik, om die reden, niet verder heb uitgelegd. Het vinden ervan is simpel: ga rechtop op een harde stoel zitten en meet (zoals bij de meeste metingen gaat dit het beste als je iemand anders kunt laten meten) van je taille tot het oppervlak van de stoel. Dit is de zithoogte. Het is altijd wat meer dan de heuphoogte maar kan alles tussen 2 en 10 cm meer zijn, afhankelijk van je figuur. Thank you so much for the tutorial! I've almost made them in a bright orange rayon and plan to wear them cycling this summer. But I'm having some problems. The crotch hangs so low, almost to the bottom of the shorts, and I made them 40 cm from waist to hem. I can't figure out where I've gone wrong. I really hope you'll come back here to read my reply because there is no contact information in your blogger profile at all, and I'd like to help finish your culottes well. The issue you mention is new to me, so I had to think about it. With such a short version, I can imagine the crotch sticking out when the culottes are flat the table or on a hanger. Does it also hang so low when worn? The only thing I can think of which you may have done wrong, is not stitching the insides of the pleat down properly. In that case, the weight of the crotch and pleat would be able to pull down too much. Another possibility, considering the fabric you're using, is the fact that rayon tends to stretch a lot on the bias. 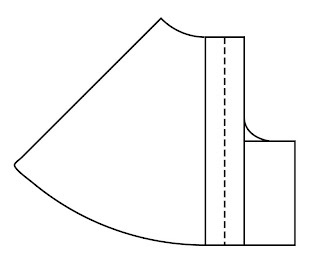 Center front and back, and the vertical part of the crotch and the inner leg seam should be cut on the straight grain. If you didn't they may have been stretched out. The crotch curve itself may also have been stretched. Hi Lauriana, thanks so much for your reply. I'm new to this so didn't realise I had no contact info in my profile. I did cut it with the inner leg seam and straight line of the crotch on the grain. But I didn't have the inner part of the pleats stitched down, should I just stitch across the top of this, at the waist? I tried this and the crotch doesn't hang so low. It must be because the rayon stretches too much on the bias, as you suggested. I will work on them. Can you suggest a better fabric to use? how much fabric should i take if i need the culotte to be 32 inches in length and 30 at waist? My culottes were fairly short and I could just cut them out of fabric folded double. In your case, I think you'd need to get at least four times the full length. about 130 inches of fabric just to be sure. 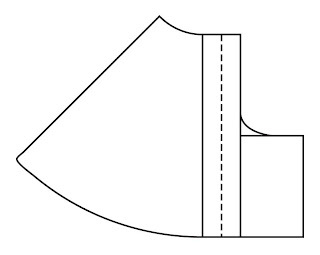 You could limit the fabric use by making the pleat and crotch a separate piece, connected to the remaining skirt with a seam. Thank you for this tutorial. I like my culottes and they were really made easily. Hi Shelley, of course I don't mind about questions. Certainly not when you're new to sewing this kind of thing. 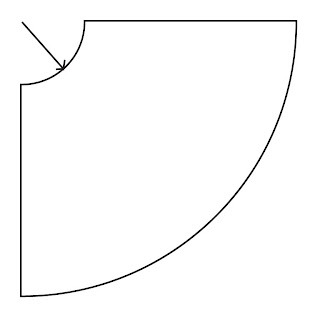 In this pattern, you draw the crotch curve from the pleat which you've already added to the center front. Bear in mind though that these are culottes, not really trousers. The fit is pretty much that of a flared skirt but with two legs and, accordingly, the crotch hangs a bit lower than it would in trousers. By the way, I'm guessing from your name that you might be Dutch as well. If you think the language (no matter how good your English is, sewing terms can be confusing) in the tutorial may be causing an extra obstacle to understanding it, don't hesitate to email me with further questions in Dutch (email address is in the sidebar on the right, at the top of the page). I am from South Africa but yes, I married an Afrikaans man with a surname that was originally Dutch :) So I understood most of your comments in Dutch as the languages are very similar (Afrikaans having come from Dutch). Thanks so much for the response. I will email you if I have any further questions. 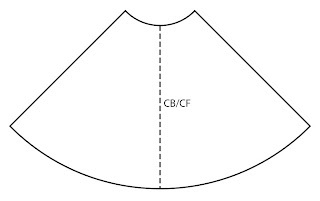 So, I draw the 1/4 of the circle skirt, add the pleat and crotch, then cut out 4 of those and start by sewing the front pleat and crotch pieces together, then the back pleat and crotch pieces together? "this is the formula for the waistline: waist circumference times 2 divided by 6,28 is the radius of the circle part"
You don't need to multiply by 2. Just use the waist measurement and divide by pi (3.14). It comes to the same number. Try it. Now I'm going to have to try to make these. Mine will be a bit longer, because I'm a bit older than you & not in as nice a shape. Think I want to add pockets too. I can't function without pockets. I am an idiot, I wanted a lower waist (below my belly) and did not adjust the sitting height measurement. 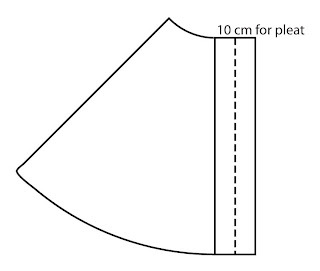 If I didn't want a pleat in my culottes could I just forget the 10cm and ad in 2-3cms for ease? Hun,where's your Pinterest button? I searched all over Pinterest with different titles and couldn't find anything like this. This is what I was looking for! Thanks so much. Hi Clippie Em, remember that old saying in some schools "there are no stupid questions"? I think that is very true when you are just starting to sew. So no need to apologize. And to answer your question: These culottes offer less of a line of sight to one's underwear than skirts but more than trousers. These culottes have a rather wide hem so I guess it would not be impossible to get a glimpse of underwear when the lady wearing them is positioned right above the viewer. However, there is seam between the legs so it won't be a guaranteed show. Thank you! This is just what I have been looking for! I didn't quite understand how the pleats were folded/sewn? Can someone please help? Hey :) It's a really nice tutorial, but I'm a bit confused about the pleat addition. If I understand right, you add a 10cm square to the right of the eight of the circle. So also the length of the waist changes, or not? With additional 40cm the waist would be much to large :D Can you help me to understand better?